Look closely – VERY closely, and in the upper half of the photo, you’ll see a metal utility box that has been covered with wallpaper. This is a box for a defunct and un-used security alarm system, about 18″ square. 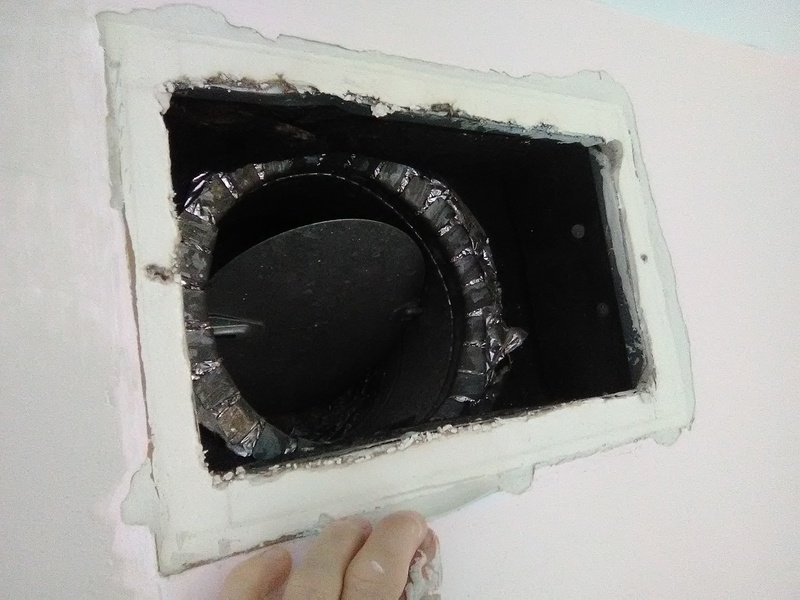 The homeowners tried to get the box off the wall – but, despite the use of various screwdriver bits and power tools, the box would not come off. 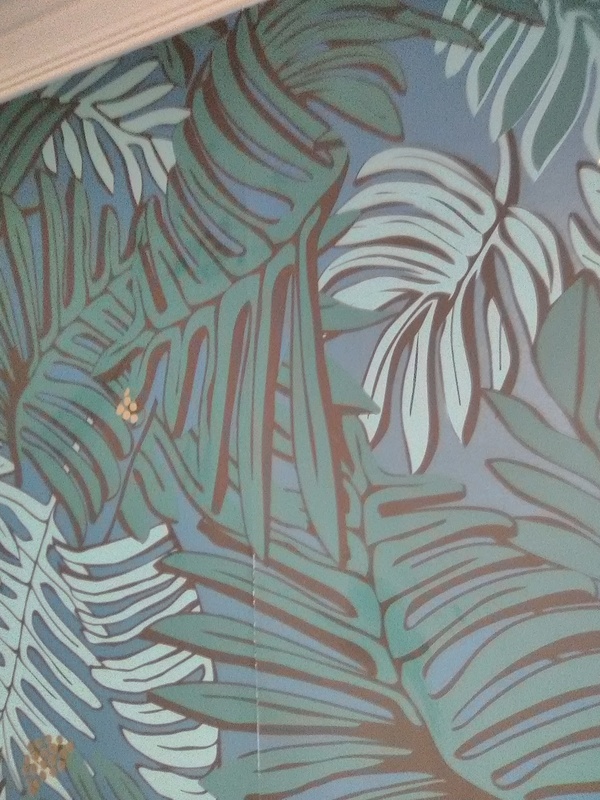 So they were going to be stuck with a grey metal blob in the middle of their beautiful wallpaper. Well, I thought I could do something with it. 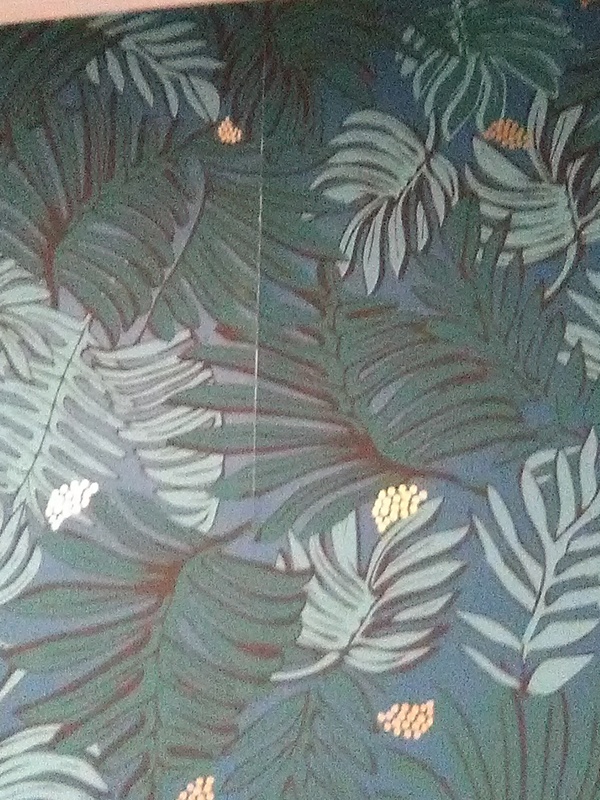 I could make it fade into the background of the wallpaper pattern. 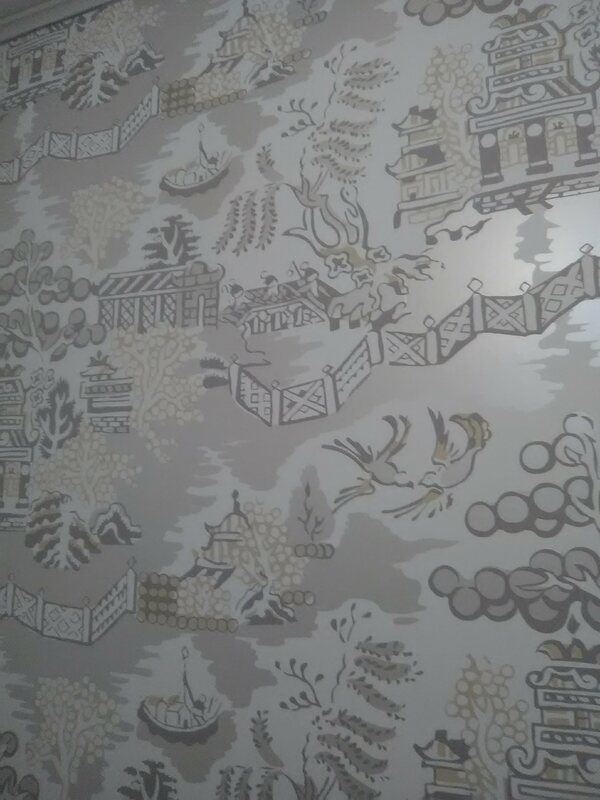 Wallpaper won’t stick to painted metal, because it’s glossy. So I took a bit of sandpaper to knock off the gloss, and my primer Roman’s 977 Ultra Prime and coated the service box. Then I matched the wallpaper pattern to the paper already on the wall, and covered the box with corresponding wallpaper. 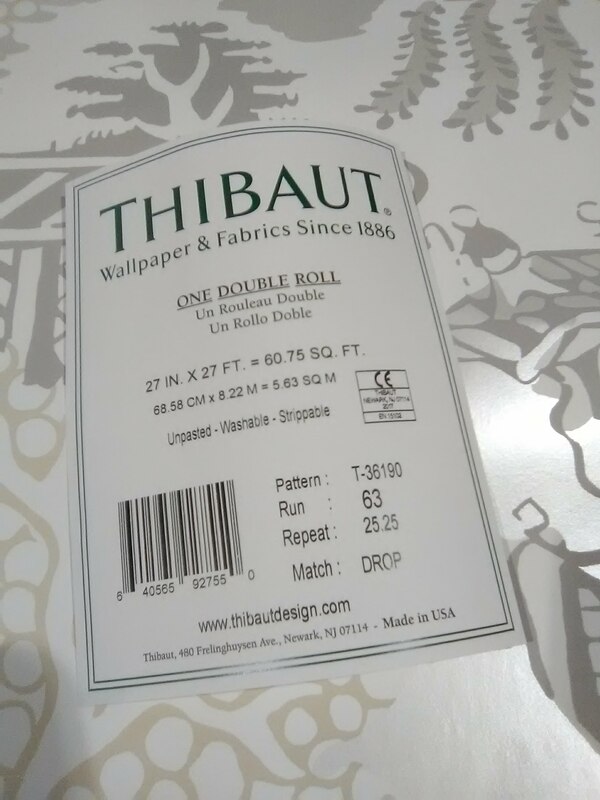 This is more tricky than it sounds, because the box is 5″ deep, which created discrepancies in the pattern match, depending on from which angle you are looking. I opted to keep the pattern matched at the corner junctions rather than matching it as it would be view from a distance on the wall. That all gets too complicated to try to explain here. The box had been primed, so it provided a good base for the wallpaper paste to stick to. 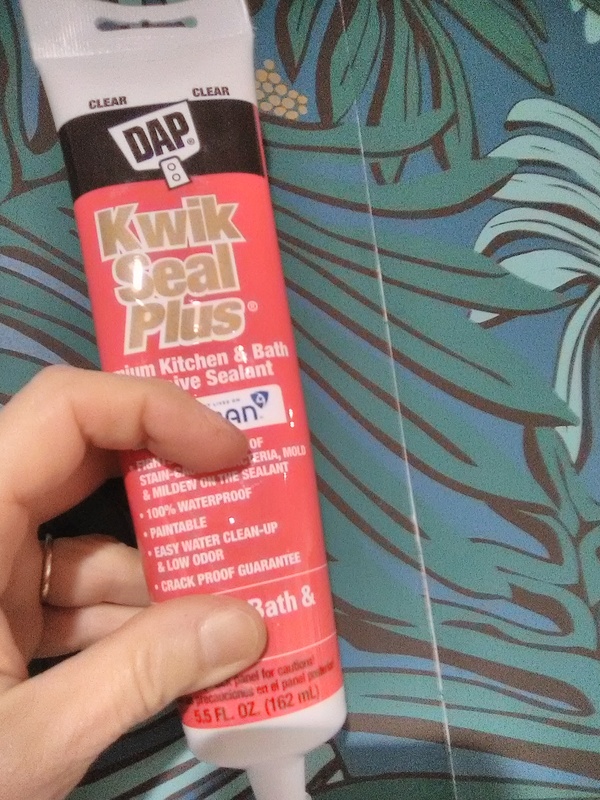 But on some areas, like the edges after an outside corner, I smeared on a bit of clear adhesive caulk, to be sure the paper would hold, even under conditions of stress such as wrapping around a corner. This whole thing took me 45-60 minutes. I am pleased with the way it turned out. From the floor, you sure would never know there is a large box sticking out of the wall. I hung this paper for a young couple in a cute 1930 bungalow in the Heights neighborhood of Houston a year or two ago. 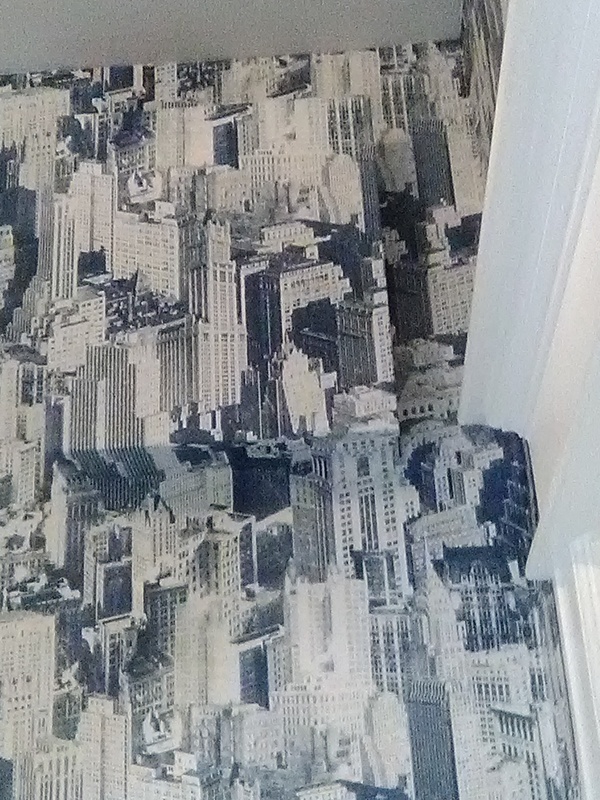 After a year or so, the wallpaper began to gap at the seams. Turns out this is not the wallpaper coming loose from the wall. What is happening is that the various layers of paint and etc. inside the wall are actually coming apart. The wallpaper dried and shrank and put torque (tension) on the wall at the seams. Also factoring in is humidity in the air, poor air circulation in the air, and possibly a moisture problem inside this wall. 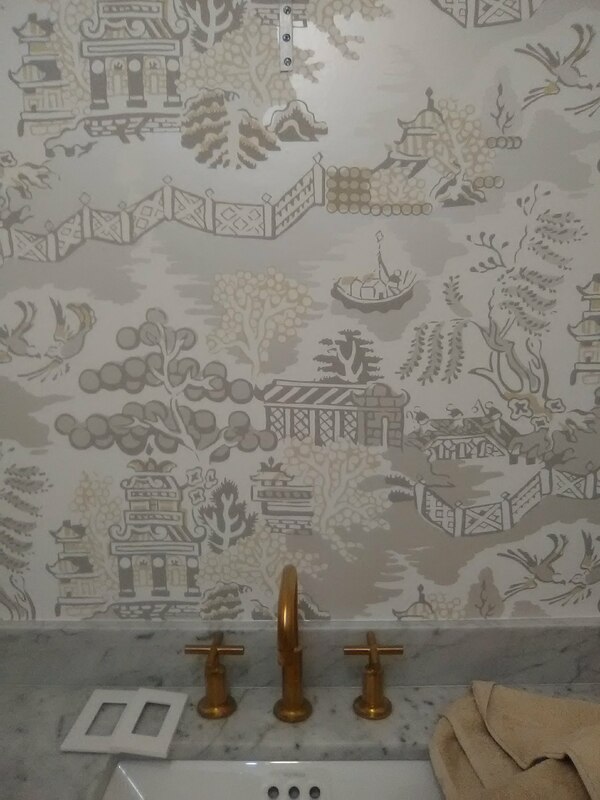 Oh, and this wallpaper manufacturer, Hygge & West, is known for using inks that curl away from the wall at the points where they cross the seams. But the real culprit is years’ worth of paint and other wall surfaces that are not compatible with one another. Back 80 years ago, you had oil-based paint. Cover that with latex paint, then do a project that creates dust that sifts onto the walls, add some gloss paint, roll on a coat of latex, then a layer of texture, then more paint … all without proper prep between. Proper prep or not, most of these wall coatings are not prepared to adhere to one another, and when drying / shrinking wallpaper puts stress on the surface, the various layers can let go from one anther and “delaminate” – which means to come apart. In the photo, you can see the thickness of the separating layers. Some layers of paint have held fast to the wall, but others have let go and curled back. Because there is dust and gloss and other factors underneath, it’s not guaranteed that anything will hold the layers back tight to the wall. Adhesive silicone caulk was my glue of choice. It will stick to porous or glossy surfaces. I squeezed some carefully into the popped seams, spread it around, closed the seam back up, and then waited for the caulk to tack up and grab ahold of the layer above it. Eventually the caulk dried enough and became tacky enough that it held the layers together. Not perfectly, but at least there was no gaping opening at the seam. The gap and a slight “pouch” still showed, so I thought of covering them with a patch that would span the seam, holding both sides together. So next I took some left over paper (ALWAYS save your left overs!) and cut out dark green palm leaves. 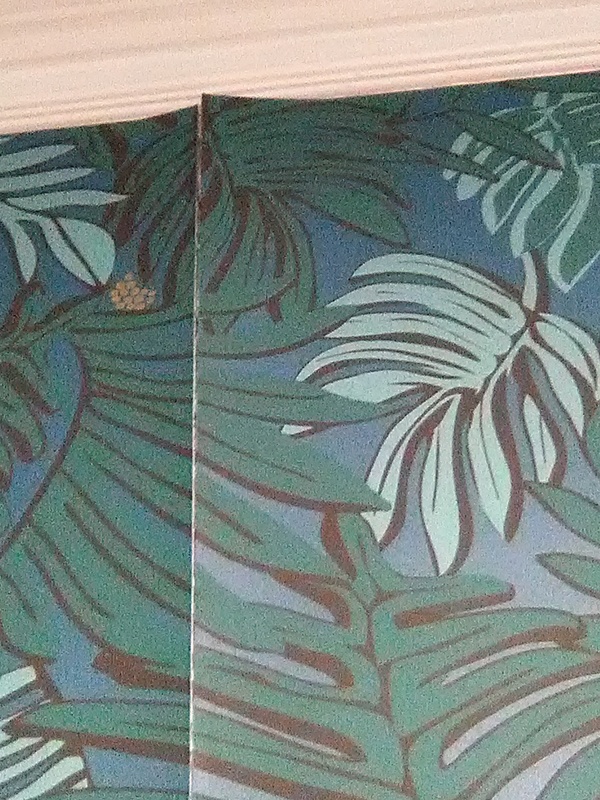 I made sure to leave a wide section on either side that was cut along the individual fronds, so they would mimic the pattern on the wall, and so there would be a wide area to straddle the seam and add stability. The area I cut out between each front helped the patch blend in with the pattern that was on the existing paper on the wall. The stupid camera ate my picture of the patch after it was cut and pasted, but before it was applied to the wall. Dang it, because that would have explained a lot of my process. Anyway, I made several of these frond-leaved patches, pasted them, and then applied them to the wall, directly straddling the popped seams. Not only did this cover and hide the open edges of the seams, but the width of the patch helped strengthen the bond while at the same time lessening the possibility that a seam would open up again. In the last photo, at the top of the picture, you can see one appliqué patch applied, straddling the seam. Moving down the wall, I would add two more similar patches over the seam. From a distance – heck, even from up close, you could not see the repaired areas.